Some of the best meals start with wine. I should know–our family cooks just about everything in wine–chicken, pork, beef, you name it–if it’s going in the oven, it’s getting cozy in a bath of wine. So imagine how thrilled I was to learn that Gallo Family Vineyards was teaming with #SundaySupper to celebrate the 50th birthday of its Hearty Burgundy wine. Immediately thoughts of boeuf Bourguignon started swirling around in my head. Should I go traditional and make the stew? Or was that too obvious? Then it hit me–stuff it in puff pastry! Crazy talk, I know. If I could just capture the flavors of boeuf Bourguignon in a filling more suitable for a turnover, I could make something exceptional. 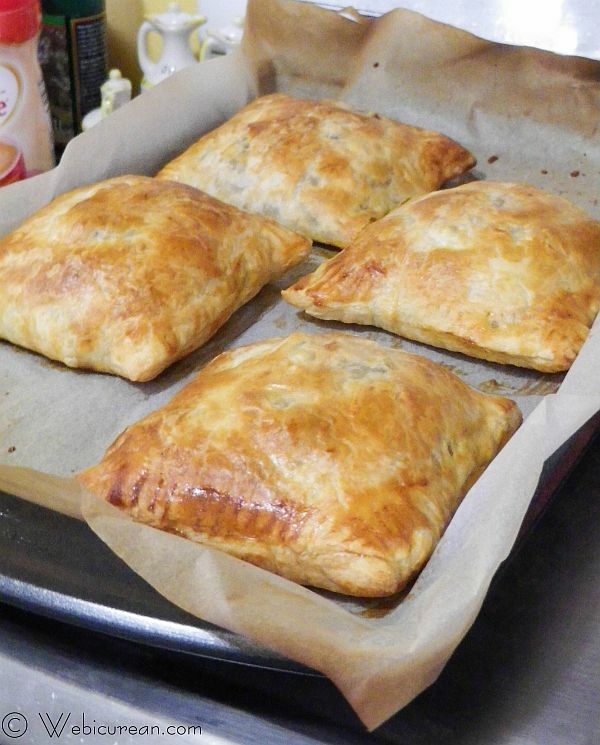 And that’s how these turnovers–beef burgundy in puff pastry–came to be. Boeuf Bourguignon, or beef Burgundy, is the quintessential French dish originating in the Burgundy region of France. While stews cooked with wine have been around for centuries, the recipe for boeuf Ã la Bourguignonne wasn’t put to print until the early 20th century when chef Auguste Escoffier first published it. Of course, once Julia Child came along, boeuf Bourguignon was introduced to a whole new generation of cooks, and what began as a simple peasant stew would eventually find itself at the center of haute cuisine. 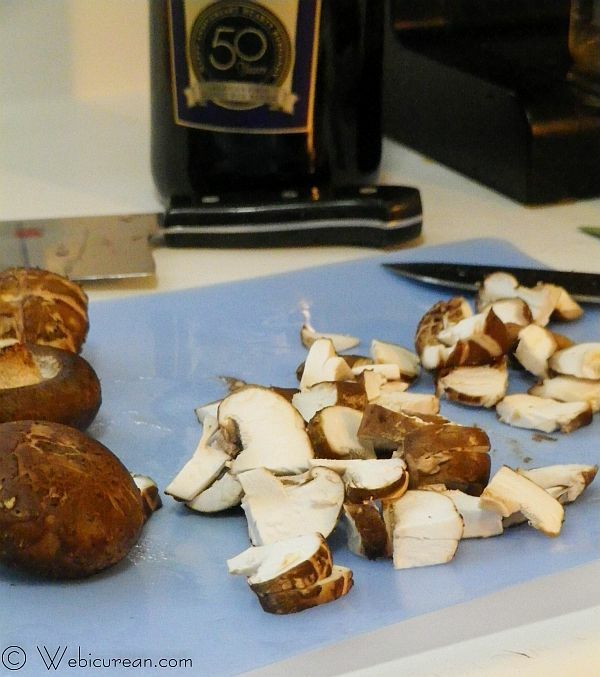 Wine selection plays an important role when making boeuf Bourguignon, and Gallo’s Hearty Burgundy truly fits the bill. The wine is a blend of several varietals including Zinfandel, Syrah, and Cabernet Sauvignon, lending a complex and rich flavor to the meat filling in this dish. This particular wine has a long history too, making a big splash on the booming wine scene of the early 70s. In fact, in Time Magazine‘s 1972 piece on the subject, Los Angeles Times wine critic, Robert Balzer, described it as “the best wine value in the country today,” a sentiment that rings true decades later. Not only did we enjoy what the wine brought to this dish, we also enjoyed sipping it with our meal. And that’s what it’s really all about–good company, good food, and good wine. These simple turnovers are a crowd pleaser. Plus you can prep them in advance, and stash them in the fridge. Then, when it’s close to dinner time, simply brush on the egg wash and pop them in the oven–a trick that makes for easy entertaining. Although I haven’t tried it yet, they probably freeze well too. I do this all the time with my Pesto Brie en Croute, storing a few in the freezer so I have something special to serve at a moment’s notice. What can I say? Nothing beats a gathering of friends without a lot of fuss. Serve with a tossed salad, crack open a bottle of wine, and enjoy! Everything good starts with bacon. :)Â Â Cook the bacon first, and never mind those extra pieces I have in there. I think their presence is self-explanatory. While the bacon’s cooking, get the veg all chopped and ready to go. Once the bacon’s done, set that aside, and get the shallots going in the pan drippings. Next add the garlic and herbs, followed by the ground sirloin and the mushrooms. 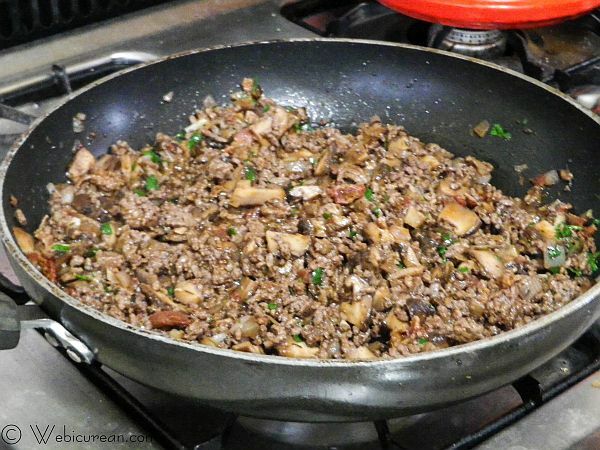 Once the meat is cooked, add in the remaining ingredients (except the flour), and let that reduce a bit. Then stir in the flour, and let it thicken up. Let this cool before wrapping in the puff pastry. Take your puff pastry sheets, and roll them out lightly on a floured surface. Cut in half to form four rectangles. Placing one at a time on the parchment paper, spoon 1/4 of the meat mixture onto one side, then fold over, and crimp shut with a fork. Repeat this process with the remaining three, brush all with the egg wash, then pop ’em in the oven. Once in the oven, they’ll only need about 20 minutes to come out golden and beautiful like these. The combination of this savory meat mixture tucked in a buttery puff pastry can’t be beat. Inspired by Julia Child's Boeuf Bourguignon, these flavorful turnovers pack all the flavor of beef burgundy stew into a buttery puff pastry shell. 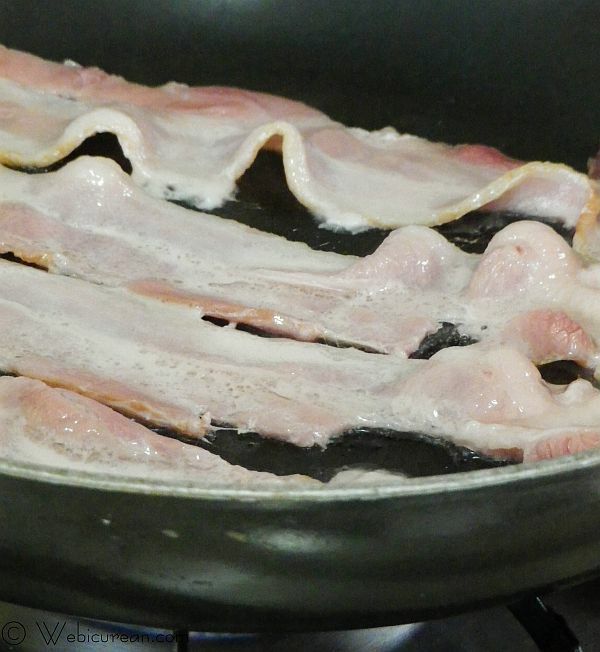 In a large skillet, cook the bacon over medium-high heat until crisp. Set bacon aside on paper towels, and reserve about 2 tablespoons of the pan drippings. Heat the skillet with the bacon drippings over medium heat, and add the chopped shallots. Cook for a few minutes until translucent, then add in the garlic and herbs. Cook, stirring over medium heat, for a few minutes, then add the ground sirloin and mushrooms, breaking the meat apart as you cook. Once the meat is cooked through, stir in the wine, demi-glace, water, tomato paste, salt, and pepper. Chop up the bacon and stir that into the meat mixture as well. Reduce heat and simmer about 10 minutes so that the liquid reduces. Sprinkle the flour over the meat mixture, stirring until well blended, and continue to cook until the juices thicken. Remove from heat and let cool for a bit. Line a large baking sheet with parchment paper. Unfold the puff pastry sheets on a lightly floured surface, and lightly roll out just to repair any cracks in the dough. Cut each sheet in half down the middle so that you have four rectangles. 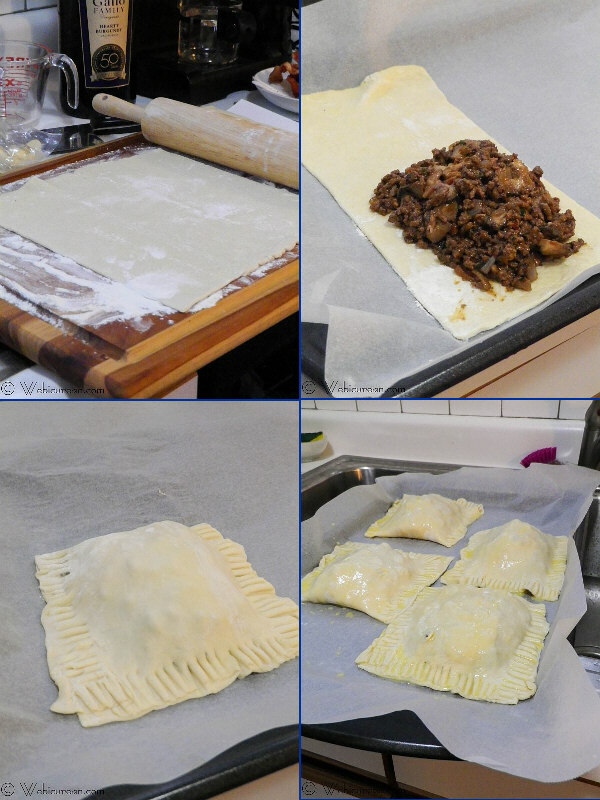 Lay one piece of the puff pastry dough on the parchment lined baking sheet, and spoon ¼ of the meat mixture onto half of the rectangle, leaving about a half-inch border. Fold dough in half over the filling, pressing edges firmly with a fork to seal. Repeat with the remaining puff pastry rectangles and meat mixture. Brush the egg wash on each turnover, and bake in the oven for about 20 minutes, or until the puff pastry is golden brown all over. *Note: Beef flavored Better than Bouillon can be substituted here. These re-heat well--just pop in a toaster oven on low heat to restore the crispness of the puff pastry. For information on where to purchase, Gallo Family wines, visit their store locator. Join the #SundaySupper conversation on twitter every Sunday! We tweet throughout the day and share recipes from all over the world. Our weekly chat starts at 7:00 pm ET. Follow the #SundaySupper hashtag and remember to include it in your tweets to join in the chat. Check out our#SundaySupper Pinterest board for more fabulous recipes and food photos. Would you like to join the Sunday Supper Movement? Itâ€™s easy! You can sign up by clicking here: Sunday Supper Movement. Oh wow! What an incredible way to enjoy beef burgundy. Puff pastry gets me every time. I know, both bacon and puff pastry are weaknesses! These look absolutely fabulous! The only thing better than Boeuf Bourguignon is enjoying it in puff pastry! Absolutely gorgeous and delicious!! To put Boeuf Bourguignon into a buttery puff pastry shell? Brilliant!!! love this! What an elegant entree! The filling sounds absolutely irresistible! Anne you make this sound so easy I must give it a try! It IS easy, you must try! 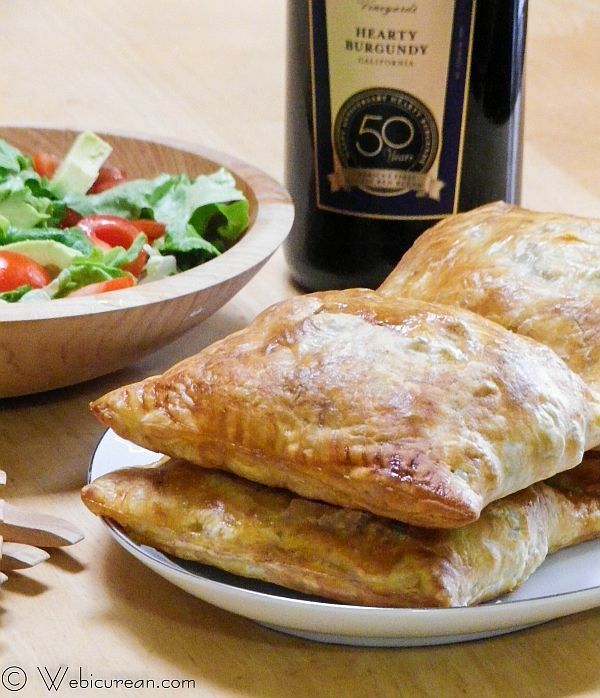 Wow, these little buttery pockets look heavenly. Love! Oh my gosh, your puff pastry looks just incredible! This would be a sure hit with the Hubby and me! Puff pastry is NEVER crazy talk! Just gorgeous and the flavors you have going on sound incredible! I wish I was having this for dinner tonight! I think you and I were sharing a brain on this one. Nothing like a savory beef filling wrapped in flaky pastry! I love that you included mushrooms and bacon. YEEEEES! i was going to do a very similar filling for leftover crepes, but now I’m making these! Thanks for the lovely inspiration! This looks very tasty and full of rich flavors. I bet it’s delicious. Thanks for sharing! Love this idea! Now you have me dreaming about the flavors of beef burgundy wrapped in flaky pastry! Exquisite! Thank you for sharing the how-to. These look AMAZING! 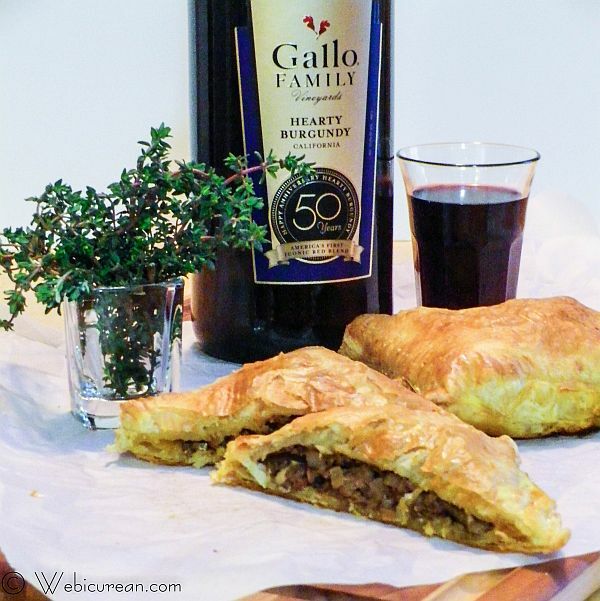 Love that you made tasty puff pastry even tastier with your delicious beef burgundy! This is absolutely perfect! Thanks for sharing such wonderful recipe.